Want a permanent driver on monthly basis? Hire from a pre-selected pool of verified drivers. Are you looking to hire a professional & reliable permanent driver on a monthly salary to drive your car? Is your existing permanent driver taking leave often that too without prior notices? Do you want to avoid taking the risk of hiring a monthly driver from an unknown source? Do not worry; EziDrive is there to help you out. EziDrive has many drivers who are interested in doing permanent duties for monthly salaries and it is from this pool that we send drivers, once a requirement for a monthly driver reaches us. All our drivers undergo a well laid down selection process incl. thorough documentation and background checks. We charge a one-time processing fee of Rs. 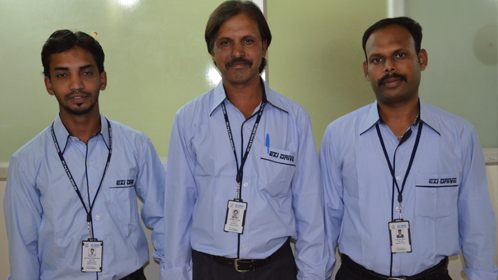 1500/- before sending eligible drivers to our customers for short listing. Monthly charge would vary depending on the duty duration per day requirement and the type of vehicle that needs to be driven. In case, the permanent driver takes leave for a day or two, we ensure that an alternate qualified driver takes his place for that day so that there is no disruption in routine for the customer. Alternatively, we also help our customers to recruit good drivers on their rolls by charging a one-time 15 day driver's salary as our finder.s fee. We also place and maintain a sizeable pool of drivers for corporate and business establishments for meeting all their chauffeur needs. Some of the big brands that we have been associated with for such requirements are Siemens, Britannia, SOT Garments, Writer Relocation, Concorde, Telstra India and Arval (BNP Paribas Co.). Get the best permanent driver on demand anytime and anywhere with Ezi Drive. For more information, call us at (080) 424 00 000 / 67 000 000 (Bangalore) & 8822800800 / 08067000010 (Chennai).